Dr Caird at launch of his biography in 2014 with author Aonghus Dwane. The funeral service for the former Church of Ireland Archbishop of Dublin Donald Caird will take place on Monday (5 June) at 11 am in Christ Church Cathedral, Dublin, with burial afterwards in Enniskerry Churchyard. Dr Caird was elected Archbishop of Dublin and Primate of Ireland in 1985, and held that position until his retirement in 1996. 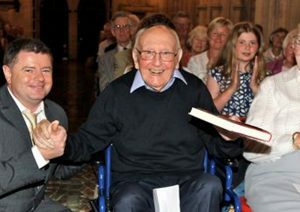 The announcement of his death was made on Thursday 1 June by the Church of Ireland Archbishop of Dublin Dr Michael Jackson. 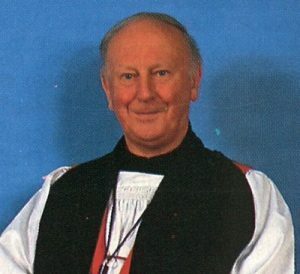 “It is with intense sadness that we have learned today of the death during the night of the Right Reverend Dr Donald Caird,” he wrote. The former Archbishop was 91 when he died. In recent years he lived at Brabazon House in Sandymount, Dublin.